The ultimate determining factor for how you should choose a web design company is the quality of their work in relation to their price. You will see below that Silver Scope Web Design provides our clients with the biggest bang for the buck. Our levels of skill and creativity are proven in our final products. Here are some of the clean, fresh, vivid, aesthetically pleasing websites we have designed. 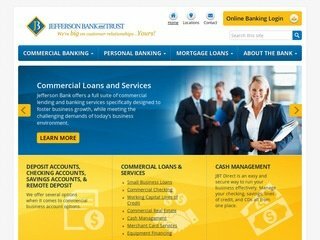 As one of the oldest local banks in St. Louis, established in 1892, Jefferson Bank and Trust came to us looking to update their website. Their goal was to maintain their established and professional reputation that so many business customers respect, while also aiming to highlight their use of new technology to provide innovative banking services and appeal to a new, younger demographic growing in the St. Louis area. We developed this clean, professional, and easy to use mobile friendly website that equally highlights their strong roots in the community as well as the variety of online banking and bill pay services they provide. The new website is ready to grow with the company as they move forward into their next 125 years serving St. Louis. As a well established supplier of bed bug heat treatment equipment and other climate control heaters and accessories, Thermal Flow Technologies was looking for an effective ecommerce website solution to sell their products online. Using WooCommerce, we developed a fully customized ecommerce store that clearly displays all of their products in an organized format and makes it easy for customers to compare and find just what they are looking for. 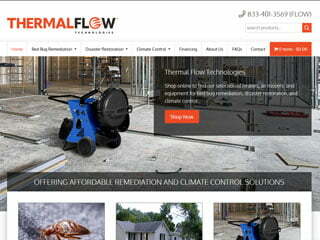 Complete with search engine optimized content, this ecommerce site will help Thermal Flow grow as an industry leader. With many years of experience providing superior trucking and logistics services to customers along the West Coast, Ace Freight & Company came to us looking for a basic website that would bring their business to the web. We developed this simple 5 page website that promotes their range of services and allows potential customers to quickly submit information on loads and request a quote. As a website that will grow with them into the future, they can easily update the website as they add trucks and services in the future. 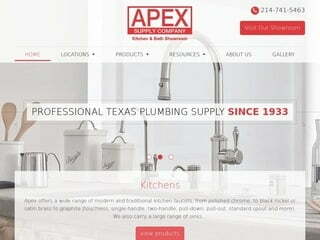 Apex Supply Company is a well established plumbing supply chain with stores across Texas. Unfortunately, their website was outdated, lacking the current product and location information that their customers were looking for. The new website we created features everything customers need including a store locator map, store location information, embedded showroom virtual tours, product information, and a photo gallery of current product samples. As this site was such as success, we also developed a similar site for their sister company Economy Plumbing Supply Company. Carriage Trucking contacted us as part of a rebranding project. The company was growing and expanding their service area and as such was rebranding to better market their new services. This website redesign project included some simple updates to their existing site including updating the website to responsive design to make it user-friendly for smart phone and tablet users. By keeping the quick quote form and other SEO content, we were able to develop a functional website that is ready to grow with the new company. LMD Express Transport contacted us looking for a new website that would help them establish a basic Internet presence and provide some important features and elements, all while fitting within their budget. With their main goals of the website design project being to attract new customers as well as qualified drivers. We developed this simple 5 page site that allows customers to request a quote with a basic quote request form as well as includes an online application so drivers can apply online. With the launch of their new Professional skincare line, Nerium needed a wholesale ecommerce website with all of the bells and whistles. We set up a customized members only ecommerce store that allows them to sell products with special wholesaler prices and bulk discounts. The store and user registration process is automated and easy to use with a simple distributor registration form allowing professionals to create a distributor account and get admin approval before accessing the online distributor store. We continued the automation by customizing the website so they can automatically calculate shipping costs, generate prepaid shipping labels, and print packing slips all without needing to copy and paste order information. 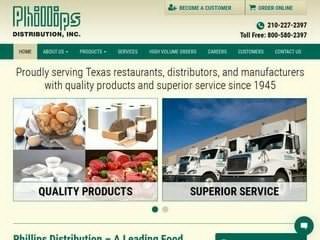 Phillips Distribution is an established food service distributor that has been serving Texas restaurants for many years. With the changing environment and industry, they have grown and expanded their product offerings and service area over the recent years. With the changes, their old website no longer fit their needs. We developed a new website in combination with the development of their new online store that will allow restaurants and customers to learn more about all of the products they offer. Complete with an easy to use online chat feature and a customer account registration form where new customers can register for a wholesale account, this new website is ready to take them the next 70 years in to the future. As a new indoor playground opening in the small community of Carpentersville, IL, Tyke Play was already drawing a lot of attention even before the doors opened. They contacted us needing a professional website that would convey the fun and safe atmosphere they offer for families while providing answers to customers many questions. We developed this bright and colorful website with an emphasis on providing pictures, pricing info, online party reservation capabilities, an event calendar, and answers to frequently asked questions. With the website up even before the official opening date, customers had access to all of the info they needed, allowing for a great opening launch. As a new trucking company specializing in expedited shipping services, Expedited Express Carriers contacted us looking for a basic website for their growing business. We developed this affordable 5 page website with a downloadable driver application, online quote request form, and search engine optimized content all designed to help the new business grow. With customized design and mobile friendly styling, this website will help the trucking company stand out against the competition. ABM Investigations is a new private investigation firm serving Mobile, AL. As a new business, they needed a website that would both promote their services as well as accurately convey their experience and expertise. We developed this site with search engine optimized content that effectively accomplishes both goals. The site also features an online contact form and is ready to grow with the company. An established logistics company with experience serving the food manufacturer, grocery, and food wholesale industry, CFM Logistics came to us looking for a new website that would represent their company and their growing line of services. Striving to be a leader in the transportation and supply chain market, CFM Logistics offers a complete range of services to meet all of their customers' logistics challenges. We developed this website to clearly list and explain their wide range of services while maintaining a layout and design that was simple and user-friendly. The new website will allow them to develop new customer relationships as they push forward into the future. Precision Plumbing contacted us looking for an upgrade to their website. While they had an existing site, it was poorly designed, did not represent all of their services, and did not rank well in search engines. We designed this website packed with SEO content to help draw in business and attract customers from all over the St. Louis area for the wide range of plumbing services they offer. The new website features a mobile friendly design that is easy to navigate and boasts a quick online appointment scheduling form to make it easy for customers to schedule service. New vehicle service contract company, Fenix Protect contacted us interested in developing a mobile friendly website. They needed a new website that would help establish them as a leader in the industry and reflect their commitment to providing superior customer service. We developed a website complete with search engine optimized content that clearly portrays their various product offerings as well as their commitment to their customers. This new website is ready to grow with the new business for years to come. As a group of reverse mortgage professionals serving much of the south eastern US, Preferred Reverse came to us looking for a unique website design that would help them stand out in the crowed market place. We developed an informative website to educate potential customers and encourage them to contact Preferred Reverse. The website includes a simple reverse mortgage calculator form that is easy to use to collect customer information. As an established pet boarding kennel with over 50 years serving the St. Louis area, Williamsburg was looking to boost their online image. Having just completed some major renovations to their building, the kennel wanted a new website with a fresh new look that would feature photos of the new facility as well as promote some additional new services they offer. We developed this fun and professional website that includes many pictures of their boarding accommodations, lists all of their services and extras, and integrates with their online booking for an exceptional user experience. Cross-border and container transport company, All Track Transport, came to us looking for a clean and simple website design that would give their company a professional image and promote their various transportation services. We developed this basic 5 page website complete with SEO content. The large rotating image header on the home page draws visitors' interest and provides an overview of the services they offer adding to both the aesthesis and functionality of the site. We developed this new website for Reverse Loan Solutions, the new reverse mortgage division of Hillhurst Mortgage. The new website, featuring a clean and user-friendly design, an easy to use reverse mortgage calculator, and many pages of search engine optimized content, is exactly what this client needed to promote their new reverse mortgage division to seniors throughout California. As one of the many reverse mortgage website design projects we have completed, this website is uniquely designed with the reverse mortgage industry in mind. As a new business selling orthotic transfer papers to orthotists and fabricators, this client came to us looking for an easy and convenient e-commerce solution. They wanted a website that would be easy to use to display and sell their various patterns online. Using the WooCommerce platform, we set up an online store that is straightforward and easy to use. The online store is perfect for their current needs and able to grow easily with the business into the future. As a young and accomplished physique competitor, Brandon Hendrickson contacted us with a dream to share his love of fitness and his knowledge of competition training with others. We developed a basic website that would allow him to share inspirational training videos, sell merchandise, promote his fitness training services, and grow his personal brand and team. Including interesting and informative search engine optimized content and highlighting YouTube videos are just some of the ways this site is designed to help Brandon reach his goals. As a new roofing company in St. Louis, Advanced One Roofing needed a basic website that would not only show their company as established, but also help draw in new business through search engines. We developed this website with 20 pages of SEO content to highlight the company's various service offerings and products. We also included a gallery they can add to as they grow and continually update as they complete new projects. With a mobile friendly design and unique look, this website is ready to grow with this new company. The Pathway Program is a substance abuse, drug, and alcohol treatment program located in Arizona specializing in treatment for teens and young adults. While their existing website ranked fairly well in search engines, it had many problems including a broken contact form. We developed a new, user-friendly site complete with quick contact form on every page and a new updated look. The new site is mobile-friendly and will help them on their mission of helping teens and young adults achieve lasting sobriety. Jost Builders is a St. Louis general contracting company offering a variety of general contractor and construction management services. As a new business, they needed a professional website that would give them the established look they want to portray while also highlighting the services they offer. We developed a basic 5 page site that gives the new business a professional appearance while being able to grow with them well into the future. Genetidyne manufactures and sells protein powders and workout supplements. As a new business, they had distribution in some retail outlets, but needed a website to strengthen their brand and portray the image they wanted with their brand. With our e-commerce website design services, we developed this site. Using WooCommerce and a WordPress platform, the client can easily manage their online store, track sales, and more. St. Louis Orthodontic Group came to us as an established orthodontist office with multiple locations across the St. Louis area. They had an existing website, but it was difficult to update and thus had become outdated as their business grew. We developed this inviting and informative website using a WordPress content management system so that the client can easily update the website as needed and ensure that information is kept accurate and up-to-date. Formerly two separate video production companies, Watch It Bend was looking for a rebranding of their company to better reach their intended target market and promote their various video production services. We designed a new logo and website with a fresh, colorful look that would tie the two companies together under one brand while clearly promoting the services they offer. This new site will grow with the company and allow them to share examples of their work on an ongoing basis. As a local family owned and operated turf management and lawn care company, Munie came to us looking for a website that would set them apart and distinguish them as leaders in their industry. We developed this website on a WordPress platform with many pages to highlight each of their services and capabilities as well as several special features that add value to their site. This includes a website photo gallery they can add to as needed and an online employment application form. As a new reverse mortgage lender in California, Reverse Home Finance contacted us looking for a logo and website that would project a professional image and provide some basic information to their customers. For this logo design and website design projects, we focused on keeping it simple and straightforward, goals much appreciated by their target market of seniors searching to learn more about reverse mortgages. Conroy Lawn & Landscape contact us as a local lawn care and landscaping company, rooted in their community of Wildwood, Missouri, looking to grow their business with an effective Internet presence. We developed this site with an emphasis on two main points: to list the wide range of landscaping services they offer and to display photos from previous projects they have completed. We accomplished these goals with a new website that is ready to grow as the company does. Rapid Freight is a transportation and trucking company offering a variety of transportation solutions for customers throughout the West Coast. They came to us looking for an affordable website that would promote their services and help give their company a basic presence on the Internet. We developed this 5 page site complete with Quick Quote form and downloadable employment application to help them grow their business reaching new customers and drivers. As an established custom architectural millwork manufacture located outside a small town in Missouri, Jadwin Millwork came to us looking for a basic website that would allow them to grow their business to reach new customers across the state. We created this elegant 5 page website that shows off some of their previous work and projects as well as emphasizes the quality of their work. With a photo gallery the client can easily update and a custom mobile-friendly WordPress design, this website is ready to grow with the company for years into the future. This project is an example of both our trucking logo and website design services. Developed for a refrigerated trucking company in California, this basic trucking website makes the most of its slim 6 page package by listing the various services the client offers as well as promoting their employment opportunities available for drivers. Search engine optimized content and a mobile friendly design complete the project and help give this small trucking company an effective presence online. Designed for a law firm specializing in avulsion fracture cases, this website was built to act as an informational resource answering everything people want to know about avulsion fracture injuries. The website answers any questions an injured person may have in a clear and concise format as well as lists examples of actual avulsion fracture settlements to help individuals see just how much their case may be worth. Complete with search engine optimized content, this site aims to help our client establish themselves as a leader in the avulsion fracture injury market. After serving the greater Indianapolis area for over 50 years, O'Malia's contacted us looking to revitalize their internet presence with a comprehensive website that truly represented their brand and showcased the many great products and brands they have to offer. We developed this responsive website that includes search engine optimized pages for many of their outdoor living products and HVAC services as well as integration with their Facebook page. This website redesign project resulted in a site that is truly reflective of the store's style and values and can grow with the company for years to come. Based out of Florida, Coastal is an established heating and cooling company. While they have a customer base of many satisfied customers throughout their area, they were looking to expand locally to reach new customers and build new long term relationships. To help with this, we developed this user-friendly site that clearly conveys all of the services they offer and emphasizes testimonials from previous customers. Complete with search engine optimized content and a responsive WordPress design, this site will help the company on their mission to reach new customers in their local area. As a new business endeavor offering food brokerage services to manufacturers across the nation, National Sales & Marketing needed a website that would introduce their young company and give them an established look to potential customers. For this project, we developed a professional logo and website, as well as business cards and letterhead all integrating a similar look and feel. These marketing materials gave the company the established and professional image they need to grow in their industry. Triton Vapor is a new wholesale e liquid manufacturer producing premium e liquid products made in the USA. They were looking for an edgy and artistic design that would help them stand out in the hip and modern vaping industry as well as quality search engine optimized coding and content to help new retailers find their business. We delivered on both wants with this hip yet professional design as well as professionally written SEO content. As a small plumbing company based out of Fort Smith Arkansas, Drain Masters was a 20 year old plumbing company looking to develop a basic internet presence. We developed a basic 5 page website to list and portray the various plumbing and drain cleaning services they offer. This starter site is a great base that they can build on in the future as they are ready to increase their internet presence and expand their reach even further. Citizens Lending Group came to us with an outdated and ineffective website looking for a new website redesign that would allow them to better reach and communicate with their target market. We developed this user-friendly website with their target market of senior citizens in mind. The website is complete with a reverse mortgage calculator and resource area to which we add regular ongoing content to help answer all of their potential customers' questions. Charlotte's Custom Drapes came to us as an established window treatment design company serving the St. Louis area. While they had an established customer base with many loyal customers, they were looking to rebrand and expand their reach to more new customers throughout the greater St. Louis area. Recognizing that many customers in this industry rely heavily on social media and reviews from actual customers as a key part of the decision making process, we integrated elements and features from the client's Angie's List, Houzz, and Facebook profiles throughout this website. We also placed an emphasis on proudly displaying photos of the client's previous projects throughout the pages. Ultimate Edge is a leading distributor of weight loss supplements. They came to us looking for a website that would perform two separate but equally important goals. These were (1) to promote and sell their healthy weight loss supplements and programs and (2) to allow them to establish relationships with new distributors who want to join their team. We easily accomplished both of these goals in one search engine optimized website complete with a members area where distributors can login to gain access to special information. For this website design project, we designed a new website for Bankhead Vegetables a wholesale pumpkin supplier serving the Midwest with bulk and wholesale pumpkins. In addition to wholesale pumpkins, they also sell a variety of fresh grown and handpicked vegetables at their local farm stands. They came to us looking for a website that would be search engine optimized to help them grow their pumpkin sales and reach new markets outside of Missouri. We gave this website a professional look while still emphasizing their homegrown, family owned reputation. Trilogy Warehouse Partners is a new warehousing and logistics company offering a complete range of warehousing and logistics services to customers nationwide. As a new and growing company, there were two things that were important for this project: (1) They wanted the website to clearly list all of the services that they offer and (2) They wanted to be able to keep their website information current as they grow and expand. We met these challenges by working closely with the client to understand and incorporate each of the services they offer as part of the website design. We also developed this website on a WordPress platform so they can edit and update information easily if needed. For this website design project, we designed a simple website for Harvath Law Offices, a personal injury law firm serving the small towns of Pacific and Washington, Missouri. They were looking for a website that would allow them to target clients in the local areas they serve, but that could also be added to in the future as their business grows. Creating a personal yet professional feeling with this website design project was important, as they wanted to convey that they truly care about each of their clients and offer a personalized approach for every client. Advantage Home Loans is an established reverse mortgage lender offering reverse mortgages to seniors nationwide. They came to us looking to strengthen their nearly non-existent Internet presence. We developed a basic 5 page site using a clean and simple design that they can easily add to in the future. Included on this site were a reverse mortgage calculator form as well as search engine optimized content written by our professional writers that would not only improve search engine rankings, but would act as an important tool to help customers gather the information they need. We designed this e-commerce website for a new startup business that sells designer door kick plates. The business came to us looking for a website that would display their beautifully crafted products and would allow them to sell the kick plates easily online. We developed this site built on the WordPress platform incorporating a popular shopping cart software that allows the client to easily add, update, and manage products and track sales through a simple admin panel. For this trucking website design project, Jack Hood Transportation, a leading trucking company serving the trucking industry, came to us looking for a website that would help them as they took on a new mission to expand their services beyond the newspaper and print industry. They wanted a website that would not only establish their reputation as a reliable newspaper distribution company, but would also advertise their additional services. One key element on this site is an interactive map of their locations that we added to show where they have hubs as well as what cities these locations service. For this website design project, our client already had an established business as a reverse mortgage lender serving the Tucson area. However, his website was outdated and he had seen his rankings in search engines drop in recent months. We developed a new website optimized for customers in his local Tucson area. This new site is responsive, easy to navigate, and ready to take his business to the next level. AMS Express is a trucking company offering a variety of trucking services ranging from asset based transportation and logistics to full service truck and trailer repair service. While the company had a website when they came to us, it was outdated and did not accurately reflect the services they offered. They were looking for a new updated website design that would promote these extensive services without breaking their budget. We developed a unique and fresh trucking website design that includes a quote form so that customers can easily request a quote for any service online. As an established organic lawn care company in New Jersey, Greener Lawns had seen a recent drop in their website traffic and leads. We helped them diagnose problem areas with their old site and developed a completely new website that is custom tailored to increase local website traffic. The new site includes a fresh and vibrant responsive design as well as optimization to target several cities in their local area. The website is complete with a Facebook integrated photo gallery that allows Greener Lawns to showcase new projects on an ongoing basis. The GoPro Inspection Group project is an example of both our logo design and responsive WordPress website design services. We developed this new website as a sister company to USA Home Inspectors to help expand the reach of their nationwide home inspector directories. The project is designed in WordPress allowing the client to easily add and remove inspectors to their online directory as needed with only a basic computer knowledge. Complete with several pages of search engine optimized content, this project is a great addition to their marketing efforts. This website is a stunning example of our responsive website design services. Designed to be compatible across all devices, this website helps establish an effective online presence for this new and growing LED sign company. Providing brief information about the services and wholesale products this company can supply, this website is set up as an effective online marketing tool that is ready to grow with this new company. For this website design project, Claims Adjusters contacted us interested in replacing their old, dated website with a new search engine optimized design that could grow with their growing company. We developed a mobile friendly site using responsive design. This website features search engine optimized content and is organized to easily allow us to add to the site as the company grows and offers new services to extended service areas. When ABLE Heat & Cool contacted us, they were an established heating and cooling company serving the Troy, Missouri area. While they had an established reputation with some customers in their area, they were looking to improve local search engine optimization with a new mobile-friendly website design. We developed this site focusing on local search engine optimization to help this small family owned business target their local area. EverGreen Industries is a growing trucking company offering flatbed trucking services to a wide variety of industries. As a core carrier for many top companies, EverGreen has been experiencing rapid growth. Because of this, they have a continued need for experienced drivers and owner operators who can join their team. We developed this mobile friendly website with the primary goal of driver recruitment. Complete with 75 pages of search engine optimized content, a functional online driver application, and an informational Driver Resource section, this website is a key tool in their ongoing recruiting efforts. Coldco Logistics contacted us as part of a major company rebranding effort they were undertaking. Along with changing their company name to better represent their expanding range of logistics services, they contracted us to develop a new logo, website, and additional marketing materials. Our logo design became the center element of their branding efforts. We developed a new custom website using a WordPress platform that is ready to take the company into this new phase, and can easily expand as the company continues to grow. Midwest Vein Care is an established vein care treatment company in the St. Louis area. They came to us interested in updating their website with a more modern look and feel. We developed this responsive website that is mobile-friendly and includes search engine optimized content to help them reach new customers throughout the local St. Louis area. Performance Transportation came to us looking for a website that would help their established oil field transportation and logistics company develop a basic presence on the web. As a well-established company in their niche industry, the company had failed to evolve with the times and as a result had little to no presence on the Internet. Now looking to update and improve their driver recruiting process to meet a growing demand for service, we developed this website complete with online driver application and downloadable paper application. The Crossroads Program is a drug and alcohol treatment center in Missouri that specializes in treatment programs for teens. When coming to us, The Crossroads Program's owners had some specific ideas of things they wanted to include on their website, but they needed help organizing the information into a clear and straightforward layout. We worked closely with them to create a layout and navigation structure that would include all of the important information from their list while making the website as user friendly as possible. We completed the project by writing search engine optimized content to help promote the three treatment centers across Missouri. As an established roofing company serving St. Charles and St. Louis, Missouri, Schneider Roofing came to us with the simple request to help their website rank better in search engines. In the highly competitive service industry of roofing, their current website was lacking what it needed to get the results they desired. We developed a responsive website framework, blog, and 25 pages of search engine optimized content to help the company achieve their online marketing goals. RRR Transportation is a trucking company based out of Georgia focusing primarily on long haul trucking for produce and refrigerated goods. The company had two main goals with their website redesign. These were to tell potential customers about their services and to attract potential drivers for their growing company. We developed this website that includes important information about the company and their services including real time load tracking coupled with many pages of search engine optimized content targeted specifically to truck drivers. For this website, the new economic development committee for the small city of Louisiana, Missouri came to us looking for a website that would act as a brochure and effective marketing tool to businesses interested in developing in their area. The website provides important information and resources and features a design that integrates well with the city's current branding and website. The Missouri ENA website is an example of our WordPress website design services. We developed this website by creating a custom WordPress design that allowed us to incorporate special features such as a news section and an upcoming events calendar. Using WordPress for this project allows the client to make updates and edits to website information as needed without any special knowledge of website design and coding necessary. As a growing expedited shipping and courier company serving the New England area, Colby Direct Delivery was looking for a website that would establish an effective online presence. By integrating an online quote request form, detailing the services they offer, and providing important contact information, we developed a website that can act as an effective online marketing tool and can grow with the company for years to come. For this website design project, Orthotic and Prosthetic Lab came to us with a general idea of what they wanted out of their site, but no clear idea how to get the project done. We developed an attractive and easy to navigate website that clearly incorporated all of the elements important to them. By incorporating patient forms, product information, location information, and a pay online link, we were able to develop a website that meets all of their needs. We developed this website as a side project to promote our St. Louis website search engine optimization and SEO copywriting services. By incorporating a modern design and numerous pages of custom written search engine optimized content, this website advertises our services to clients in the local St. Louis area and allows us to further improve our internet presence. As an example of our trucking website design services, the SSI Express website is a simple site designed to establish a basic online presence for this trucking company. Specializing in LTL trucking for the West Coast, it was important that we emphasized the company's trucking schedule and routes. We also included a simple quote request form on all pages of the site as well as search engine optimized content to help improve search engine rankings. For this website design project, P.I.T. Pipe came to us an established pipe and steel supplier interested in expanding to the online market to find new customers and bring in new business. With this goal in mind, we developed a website packed with 25 pages of search engine optimized content. Our SEO copywriters targeted a variety of relevant key phrases for the different types of pipe and steel products they supply. We also included some calculators and pipe schedule charts on the site that their customers would find extremely helpful and useful in an effort to add value to the site. The Wallach Law Firm website is an example of our attorney website design and law firm SEO services. For this project, we felt it was important to create a website that served several main purposes for this law firm, including providing an introduction to the attorneys at The Wallach Law Firm and their qualifications, giving an overview of the services they offer, and showing results they have achieved in previous cases. We worked closely with the client to develop search engine optimized content that portrayed this information while optimizing their site for relevant key phrases. Founded by an experienced financial professional, Advisors Insurance Direct aims to be an informational resource for individuals looking for the best life insurance policies. For this website design project, it was important that the overall website design be functional, professional, and easy to navigate. The website acts as a wealth of information with custom written pages to address any question visitors may have. Additionally, the website serves as a complete resource with retirement and life insurance quote calculators and online appointment scheduling. We designed this private investigator website for a new private investigation firm serving the Sacramento area. As a new business, the company needed to make their limited marketing budget work to its fullest potential. We developed this site with 11 pages of SEO content, optimized to attract clients in the local area while giving the business a trustworthy and established look. Overall this website, in combination with the social media pages that we created, establish an effective online presence for the new business. Navigation, Inc is a growing trucking company serving the entire United States. They came to us for our trucking website design services looking for a website that would attract owner/operator drivers to their business. We developed a clean and simple website that includes 10 pages of search engine optimized content. For this project, we also created a Facebook page complete with SEO content and custom graphics that coordinate with the website for consistency in marketing. The Bleachers website is a basic example of our bar website design services. For this website design project, the client wanted a quick and simple website that could establish a basic online presence. The main purpose of the site is to show the location, menu, and photos of the bar. This website is a basic, but functional site that can easily be built on in future to grow with the business. The PureVapor website design project is an example of our responsive website design services. For this project, we created a visually stunning website. Keeping in mind that the target audience of this store is hip and technology savvy individuals, we made this site responsive so that it will display neatly on any smart phone, tablet, or other Internet enabled device. This is a basic website with just a few pages of SEO content designed to help the new business begin to develop an online presence. The site can easily be added to in the future with more search engine optimized content, when the store is ready to expand and grow. For this website design project, we developed a new website for local cake and candy making supply store, My Son's Cake and Candy Supply. Using local search engine optimization techniques, we developed a website that would attract local business to the store and allow them to promote their main products and classes. The Eagle Eyes Investigations website is a great example of our private investigator website design services. For this website, we developed a basic 10 page website complete with search engine optimized content. The website design made the most of the client's unique logo while keeping the focus on the services they offer. We also provided social media design services for this client that emphasized a consistent and branded design. The website and social media pages are an effective start to helping this new business establish an online presence. We developed this new website for Southwestern Materials with the primary goal of search engine optimization. The website is an informative resource to help individuals learn about sodium bentonite, the benefits this product offers, and how this product can be used. The website also allows customers to easily place orders online or contact the supplier to learn more about the sodium bentonite products they sell. With this website redesign project the primary goal was to help the company improve their rankings in popular search engines. We wrote 25 pages of search engine optimized content for key phrases that were carefully chosen based on competition and relevance. We also developed a new updated look and clearly organized navigation. For this website design project, we redesigned the logo and website for Expressway Transportation. The new website is both functional and informative with information on all of the company's services as well as several freight and shipping calculators. Loaded with 25 pages of SEO content, this website is an effective marketing tool to help the established company grow. For this project, we designed a new website and logo for The Jacobs Law Office in St. Louis, Missouri. The website includes numerous pages with SEO content to attract new clients to the firm. It also allows clients to access important forms and information online, making this an effective tool for the law firm when it comes to attracting new business and serving existing clients. Kurtz Nursery is a leading topsoil and mulch supplier that has been serving the St. Louis area since 1925. However, even as a well-established company, they failed to build any internet presence. We developed a search engine optimized website for the company that would target new local customers and could provide important information about the products the company supplies to existing customers. This website not only boasts a unique and creative dirt-themed design, but it is optimized to help the company establish an effective internet presence. Jeannette York is a marriage and family therapist and couples counselor located in Burbank, CA and serving the entire LA area. She contacted us looking for an affordable website that would allow her to market her services to customers in the local area. For this local website design project, we selected the key phrases and page names that would maximize her budget and allow her to reach customers interested in each of the main categories of counseling she offers. This 5 page website will allow Jeannette to establish a basic internet presence, and it can easily be added to in the future when she is ready to expand. When redesigning the website for the Missouri Association of Code Enforcement, our goal was to create an attractive website that would allow the association to share important information with members and potential members. This website does just that, while also incorporating PayPal buttons to allow the organization to collect dues and other payments. Access STL West is a regional marketing collaboration between economic development organizations dedicated to attracting business to the St. Louis West region. For this project, they needed a website that would fit within their budget while allowing them to provide important tools and information to interested businesses. This basic website also integrates the LocationOne information database seamlessly into the design of the site. Calisa is a furniture consignment store located in St. Peters, Missouri, a suburb just outside of St. Louis. For this website redesign project, this retail store wanted a website that would convey their upscale image. It was also important to display a number of photos showing the variety of merchandise the store typically sells. Therefore, we included a large rotating image header on the home page. We also linked the store's Facebook photo gallery with the website to allow the client to display even more photos. For this website design project, we developed a website promoting the Dobbs Brace, a revolutionary new treatment option for children with clubfoot. With an organized layout, this website acts as a great resource as it makes important information about the bar easily available for parents and orthodists. This construction company website, packed with 50 pages of search engine optimized content, was designed to attract customers from throughout Crystal City and the entire St. Louis metropolitan area. The website includes pages optimized for the wide range of services that the company offers from roofing to interior remodeling and additions. This website helps establish a great internet presence for the company and acts as a great marketing tool. Westervelt Transport is an established trucking and transportation company based out of Belgrade, Montana. With over 40 years in the industry, the company wanted a functional website that would help them convey this established image and allow them to reach new customers. Like all of our trucking website design projects, this website includes search engine optimized content and a convenient quote request form potential customers can complete. Vincent Ruzzi Plumbing and Heating came to Silver Scope Web Design looking for an affordable website that would allow them to advertise services and attract new customers in their service area. For this local website design project, we included 10 pages of search engine optimized content. With a clean and easy to navigate design, this website acts as an effective marketing tool for reaching local customers. Front Sight Firearms is a retailer that sells a complete variety of firearms and firearm accessories. While they had an established customer base in Texas, the company wanted to expand their reach to nationwide sales with a website and online store. We developed this edgy, grunge style website that integrates seamlessly with their online store. We also offered logo design services for this client to help improve their branding and build customer confidence and loyalty. Midwest Heavy Haul is a trucking and transportation broker that specializes in providing heavy haul and other transportation services. While this company had a website, they were looking for website redesign services that would help them develop a new site, which would result in increased traffic and business. We developed a large website complete with 34 pages of SEO content designed to increase search engine rankings and help this company bring in new business. 28/65 Brewhouse is a new sports bar and grill located in St. Charles, MO. They came to us looking for a basic website that would allow them to display their menu, promote food and drink specials, and list special events on a calendar. We created a website design that captures the atmosphere of the sports bar and promotes some of the location's top selling points such as a wide selection of beers and vodkas on draft, a large number of HD TVs, and a game room with some of the most popular games. We also integrated a Google calendar into the website so that the bar manager can update special events with no special training or knowledge necessary. 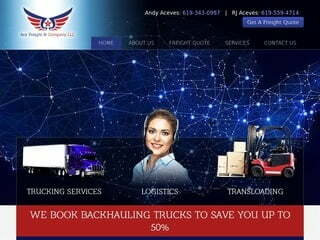 The All Star Transportation website is an example of our trucking company website redesign services. For this website, we created 25 pages of search engine optimized content, optimized for all of the trucking services the company offers. Throughout the entire website, we kept the focus on two main target audiences, drivers searching for jobs and customers interested in shipping truckloads. We also integrated buttons into the design of the website so that customers can request a freight quote and drivers can access the driver application from any page. DEW Distribution is a third party logistics company offering a wide range of transportation services to customers across the country. They contacted us interested in redesigning their old website. The primary goal of the new website is to attract new customers and to encourage customers to contact the company. Therefore, we created a detailed quote request form that is highlighted directly on the home page and can allow the company to collect contact and shipping information from potential customers. The five page website that we designed for Fargo Cargo is a basic example of our trucking website design services. This website was developed with the intention of establishing a basic presence on the web for this nationwide company. The website includes 5 pages of SEO content to attract website visitors and collects information from visitors with an easy to find quote request form prominently displayed on the home page. The project we completed for MedicalAlert360 is an example of both our website design and logo design services. MedicalAlert360 is a company offering primarily medical alert alarms for seniors as well as a variety of other services that are beneficial for seniors living alone. The website that we designed makes use of a rotating header to promote several of the services the company offers and list key benefits of these services. The layout for this site is clear and the design simple and free of clutter to keep the focus on the products and allow website visitors to easily find the information needed. LTL Systems is an LTL trucking company based out of St. Louis, Missouri offering direct less than truckload shipping, warehousing, and distribution services to customers across the country. The company came to Silver Scope Design interested in redesigning their existing site, but not knowing what they really needed in their new website. We worked with this company and developed a new website that would better market and advertise their services with clear navigation and informative, search engine optimized content. We also included a freight request form into the design of this site to make it simple for customers to quickly request a freight quote for any shipping service. This website design project was completed for Wermke Spring, a local spring manufacturing company that manufactures a complete selection of springs and custom springs for all types of manufacturing, mechanical, and production purposes. The company came to Sliver Scope Design with a very basic and outdated website. We created a new, updated design and search engine optimized this new website for some of the most relevant and important key phrases. Another key aspect of this design was our ability to incorporate special forms into the design of the site that allowed customers to submit detailed information and request a quote for custom spring orders for some the most popular types of springs. This is an ecommerce website that we set up for an affiliate of the popular checks by mail and online check company, Checks Unlimited. The goal of this website design project, as with any affiliate website design project, was to attract traffic from search engines and to encourage new customers and website visitors to purchase the products. Therefore, we placed the products where they could easily be seen, and we also included search engine optimized content on each page. St. Charles Hardwoods is a St. Louis area hardwood lumber and woodworking store selling a wide variety of in stock and custom wood and lumber products in their two local stores. The website is an example of our local business and retail store search engine optimization and website design services as it includes 50 pages of search engine optimized content that is written to market the company's many different products available. The overall design of this website is unique as it utilizes a wood grain background to emphasize the hardwood and lumber theme. The Shadowmaster Novels are a set of mystery and horror novels that combine elements of science fiction, mystery, suspense, horror, and the supernatural. We developed this website to coincide with the publishing of the first four books in the series and to advertise these books to potential readers. The website design incorporates artwork from the book covers. The website includes search engine optimized content, and it allows visitors to download excerpts from the books or to buy the books through Amazon. This website redesign project was completed for Murphy Home Solutions, a St. Louis Realtor specializing in lease purchases. For this website redesign project, the client needed us to redesign and update their old, outdated site. They were hoping to achieve a simple and updated design that would allow customers to easily navigate and find information on their site. We developed this clean and neat website that allows the focus to remain on the important content and videos the company uses for marketing their services. McDonald Investigation is an established private investigation company located in Kansas City. This company was looking to expand their business in order to serve clients throughout the entire Midwest. Therefore, they contacted us to redesign their existing website. Our goal with this website redesign project was to create a website that would improve the company's internet presence. Therefore, we developed a website that clearly displays many of the company's available services. This website is also search engine optimized to reach customers throughout the Midwest. Turbine Generator Technical Services is a small company of turbine generator field service engineers who offer affordable turbine and generator consulting and management services for electric and utility companies. The company needed a complete website redesign for their existing website, which was ineffective and outdated. After closely examining the company's services and reviewing competitors' websites, we were able to re-design a new website that provides more information about the company's services and portrays this information in a clear and organized manner. This website also uses search engine optimized coding and copywriting to attract new customers to the business. Jacqi Beachler is a St. Louis hair stylist who offers a wide range of hair styling and coloring services to clients. She came to Silver Scope Design looking for a website that would help her build her business and attract new customers in the St. Louis area. We created this search engine optimized website that lists, describes, and advertises all of the hair services she offers to clients. It also offers a special link that allows new and existing customers to schedule their hair appointments online. Minton Development is custom home builder that offers luxury home building services for clients located throughout the St. Louis area. The main purpose of this website is to enhance the company's professional image and to supplement the brochures and additional marketing materials the company already uses. Because this company works with only a few select clients at a time, the primary goal of this website was not to attract a large number of consumers, but instead to show off pictures of previous projects and to help the company establish and build a relationship with potential customers. The Powderly Law Firm is a St. Louis law firm specializing in bankruptcy law services. With this lawyer website design project, our main goal was to highlight the law firm's available services while also attracting new customers and clients in the local St. Louis area. We developed a layout and navigation structure that allows potential clients and search engines to easily see what services the website and company has to offer. This search engine friendly website will act as an effective online marketing tool to continue to attract potential clients and to encourage new customers to contact the law firm. The I-Con Group is a private investigator agency in St. Louis offering a variety of surveillance and private investigation services. The website that we developed for this company prominently displays and advertises some of the company's primary investigation services. It is optimized using SEO content to attract local customers who are in need of these services. This basic website is a good start that will help the company build an internet presence that they can develop and expand in the future. Stein Transportation's primary goal with their new website was to attract customers to their business and to allow potential customers to easily contact their company for a trucking quote. At Silver Scope Design, we created a website for this trucking company that clearly displays the company's available services. It is complete with search engine optimized content and coding in order to attract potential customers through popular search engines. Therefore, this website acts as an effective marketing tool to reach potential clients from around the country. Florissant Sod Company is a St. Louis sod company offering sod delivery and installation services for clients located throughout the entire St. Louis area. This company came to our St. Louis web design company interested in creating a website that would attract new customers to the business while advertising their available sod services. When developing this sod company website, our web designers focused on creating a layout that was straightforward and easy for potential customers to navigate. By utilizing many elements of SEO, we created a search engine optimized website that will act as an effective marketing tool for this local sod company. The Pisa Group is a newspaper telemarketing company that offers customer service and marketing services for newspapers. They came to Silver Scope Design looking for a redesign of their existing website. We created a content rich website that is optimized for a variety of the services, which this company offers to clients. While this website provides a substantial amount of information about the company and its available services, it is organized into an easy to follow layout. For this website redesign project, we focused on content development and search engine optimization in order to create a website that will be an effective marketing piece for the company. Suntan Pools & Service. Inc.
Suntan Pools and Service, Inc. is a residential swimming pool construction company in the St. Louis area that specializes in serving the community of Oakville, MO. While the company primarily offers in ground swimming pool construction services, they also provide a number of other products and services including regular maintenance, repair services, deck and patio construction, and pool remodeling. Suntan Pools came to Silver Scope Web Design looking for a website that would target customers in their local area and inform them of their range of products and services. As the company generally receives new clients through customer referrals, with 80% of business coming through these referrals, we included a Testimonials page in this website design upon which the company can display testimonials and customer referrals for their pool construction services. Crestwood Tubulars is a pipe distribution company that distributes new and used steel pipe and tubing products to customers located around the country. Organization and color made this redesign for Crestwood Tubulars, a St. Louis based distributor of steel pipe, tubing, and round bar products, simple yet sleek. By utilizing the seemingly easy concept of a structured navigation, it allowed us to reformat this website in a way that visitors could get the information they needed without hunting throughout the site. With a focus on usability, our designers created this brochure style website to allow customers to find relevant product information at their fingertips. Without a doubt, careful planning and vision were the keys to this company's online success. We created a very simple and basic website for this company many years ago and now this new website is an example of our website redesign services. As Crestwood Tubulars had been pleased with our work from the past, they again contacted us to express an interest in taking advantage of our SEO services as well as designing a new site that fit with their growing and evolving company. After some consultation, we decided the best approach was to replace the now outdate website with a new design and new content. We developed a new navigation structure and added many pages to the new website in order to target business for this growing company. Inman Heating & Cooling is an established heating and cooling company that has been serving customers throughout the St. Louis area for years. The company had an overall website design with which they were happy, but they came to Silver Scope Design especially for our SEO copywriting and search engine optimization services. They were ready to improve their search engine marketing efforts and increase their overall web presence. We created a content rich website that includes a number of pages with SEO content in order to increase their ranking in search engines and attract new website traffic. Harvey Plumbing is a local plumbing company located in Tyler, TX. This company had been providing local customers with plumbing services for many years and was ready to spread their business and reach new customers by developing an online presence. We created a website for this company that includes custom search engine optimized content to showcase the company's available services. This content also helps target local customers searching for a plumbing company to perform these services. Sokoloski Investigations is a private detective agency in Kansas City that offers a variety of private detective services including cheating spouse surveillance, insurance fraud investigations, and background checks. This company was referred to Silver Scope for website design services through another private detective agency that we have worked with in the past. They wanted a website that would list their services and serve as an effective online marketing tool. Because the company offers many different services, we did this phase one of their website design to focus on their most popular services while leaving the option to add pages for additional services in the future. This website includes our custom copywriting to describe and attract new business for several of the company's popular services. The Petraborg Law Firm is a local St. Louis law firm owned by experienced workers' compensation defense lawyer, Julie Petraborg. While Julie has been working as a workers' compensation defense lawyer for many years, she recently decided to open her own firm serving the St. Louis area. She contacted Silver Scope Web Design interested in a website that could attract new clients to her law firm and showcase her complete selection of legal services. This website emphasizes the fact that the law firm is owned by an experienced lawyer capable of offering a variety of workers' compensation related services to businesses. This website is an example of our law firm website design services for lawyers who want to emphasize their commitment to each client and their ability to offer each client individualized and personalized service. Frosty Favorites is an ice cream truck company that has been serving frozen treats to the St. Louis area for many years. The company wanted to expand their reach in to the ice cream truck rental business and market their rental services for corporate events, company picnics, school carnivals, church picnics, birthday parties, and other special events. We developed this website so that it is optimized to attract individuals who are looking to hire an ice cream truck for their upcoming event. This process included performing research to learn for which phrases people are commonly searching as well as developing custom content based on this research. The design of this website evokes memories of visiting ice cream trucks as a child in order to remind adults of the fun of an ice cream truck. The use of photos on this site also emphasize the ability for ice cream trucks to pull families together with a shared love of frosty treats. The website that we developed for Advanced Environmental Services includes our website redesign, SEO copywriting, website hosting, and search engine optimization services. This website is designed to attract new customers to this environmental remediation company from throughout Missouri, Illinois, Kansas, and Iowa. This website provides a large amount of information in a clear, easy to follow manner to help inform potential customers about all of the companies wide range of services. Through the use of uneven edges and unique textures in combination with clean lines and a simple color palate, this grunge website design project achieves a modern and hip, yet still professional feel. After Silver Scope Web Design developed a main website for Advanced Environmental Services, they were so impressed with how the new website was helping their company that they decided to request a second website to highlight their epoxy flooring and concrete floor finishing division. We created the second website with a completely new design and separate look and feel from the company's original site. This website was optimized to attract business for the company's concrete floor finishing and epoxy flooring services, which are available to commercial and industrial clients. The project included search engine optimized website design and custom SEO copywriting. Hughes Auto Body operates several St. Louis auto body repair shops throughout the St. Louis area. As a family owned, full service auto repair shop, the company was looking for a website that would allow them to advertise their complete auto body repair services to local customers. Our automotive website designers developed this website that clearly displays all of the services available, offers answers to commonly asked questions, and allows customers to request a free auto body repair quote online. Completing this custom website design project is custom SEO content, which is written to target new customers from around the local St. Louis area. Metro Lawn Sprinkler is a St. Louis sprinkler installation and landscaping company. Over the years, the company has also expanded to provide a variety of other services including paver patio installation, retaining wall construction, outdoor lighting design, drainage system installation, and commercial boring and trenching services. Silver Scope Web Design created an attractive, easy to navigate website for this company that displays their variety of services. We also included a number of pictures, brief descriptions, and several flash videos on the Metro Lawn Sprinkler site to help better display the company's services to potential customers. Discount Smoke Shop is a discount tobacco store with locations across Missouri, Illinois, and South Dakota. This website is an example of our brochure style retail store website design as it includes information about the company, products sold in stores, coupons and monthly specials, and store locations. When Discount Smoke Shop came to Silver Scope Web Design, they were looking for a website redesign that would give them a professional looking website to inform customers about their family of stores and target customers in key cities throughout Missouri, Illinois, and South Dakota. This website does just that as it offers a clean design and is packed with informational, search engine optimized content from our experienced copywriters. In addition, the website offers an easy to use store locator that allows customers to quickly find the location nearest them. Premier Knowledge Solutions is a Microsoft Certified computer training provider in the St. Louis area. This company came to Silver Scope Web Design hoping to achieve a few main things with their new website. They wanted a new and more aesthetically appealing website design, better website organization and a simpler navigation structure, and a search engine optimized website that could attract clients from across the country. Silver Scope delivered all of this with a new content packed, search engine optimized website. We evaluated the company's old site before developing a new layout and navigation structure, which would allow individuals to easily sort through the large amount of information on this site and quickly find what they were looking for. We also included a number of SEO articles throughout this website in order to attract business and draw traffic from search engines. M & L Foods is a leading food service distributor and supplier in the St. Louis greater metropolitan area supplying frozen foods, canned goods, and seafood for restaurants and other commercial customers. As this company has been distributing food to the St. Louis area for generations, they came to Silver Scope Web Design with a solid customer base, but with hopes to broaden their exposure and gain new customers in the St. Louis area. To achieve this goal, we developed this brochure style website, which is search engine optimized for the company's target areas and designed to attract new business. Steve Hausmann is a PGA golf professional who provides golf lessons to adults and children of all skill levels. He found Silver Scope Web Design when looking for an affordable web design company to develop a website that would advertise his services. As a small business owner, Steve needed a basic website that would act as an effective and affordable marketing tool to local people looking for private golf lessons. Our website designers developed this website using several principals of search engine optimization, resulting in a website that will help attract new clients. This website also allows website visitors to sign up for the Hausmann Golf newsletter, which provides Steve Hausmann with email addresses for potential customers and allows him to stay in contact with current and past customers. Transmissions To Go is a Transmission Repair Shop in St. Louis, MO specializing in all year, make, and model transmissions. They even repair and rebuild Racing Transmissions. This automotive repair shop came to Silver Scope Web Design for an informational website that would attract customers to their business. We developed an easy to use website that even offers customers the ability to schedule a appointment for their automotive repair. This transmission repair shop website acts as a great online marketing tool for the company and reduces administrative duties with the convenient online appointment-scheduling feature. Saeger Search is a St. Louis based insurance recruiting firm specializing in servicing property and casualty clients. Their old website was outdated and boring. After some discussion and consulting with our website designers, they decided that the best route for them was a completely new website with a fresh, modern look. Since Saeger Search fills many job openings in St. Louis and the greater Midwest area, we integrated a St. Louis riverfront photo with the famous Arch as the focal point of this website. Our web design team also designed pages that are more search engine friendly and optimized to increase the company's exposure online. Jammed packed with 25 pages of search engine optimized content, the goal of this website was to attract new customers in the St. Louis area to this local heating and cooling company. Being in a highly competitive industry, this company needed a website that could help them build and maintain a competitive edge in the local market. This website includes pages targeted towards several services the company offers as well as local areas within St. Louis. We also provided social media marketing setup services to further enhance the company's internet presence. Missouri Turf, a St. Louis sod company, installs sod and grass seed for residential and commercial customers, specializing in new golf course construction, restoration of existing golf courses, athletic complexes, custom homes, large seeding and hydro seeding projects as well as wetlands mitigation work. Silver Scope Web Design's Landscaping and Lawn Care website design services were a perfect match for Missouri Turf, who came to us looking for a professional website to advertise their services. This website includes information on the sod and seed services that the company offers as well as provides other relevant information regarding sod types and sod maintenance. Overall, our website designers have made the Missouri Turf website a crucial resource for lawn care and maintenance tips, therefore building the company's credibility among customers. St. Louis Foundation Repair and Waterproofing has over 70 years of experience providing basement waterproofing services as well as foundation repair for both residential and commercial customers in St. Louis, MO. The company came to Silver Scope Web Design for our custom website design services after realizing they were missing a large part of their potential market due to insufficient inbound marketing. Our web designers developed a search engine optimized website to help attract new local customers to the company. An informational website from Silver Scope Web Design is just what this local St. Louis foundation repair and waterproofing company needed to round out their marketing plan and improve the company's internet presence. "As the bodies pile up, a young detective must seek advice from the only psychopath he knows - his brother...." With the release of his new psychological thriller, author Jack Kerley wanted a new website to promote his novel and intrigue his audience. We designed this website to be informative and to give the website visitor a feel for who the author is and how he thinks. This website helps visitors to learn more about the authors' books and upcoming events and even allows fans to join an exclusive mailing list to stay up to date with the author's latest releases. Home Care Handyman is a St. Louis handyman business offering home repair, maintenance, and home safety services. With a limited budget, this business needed a basic search engine optimized website that would attract potential customers in the local area and provide an overview of the many different types of services the company can provide. We developed this five page website featuring a clean layout and design that can easily be added to in the future and will grow with the business. The Cutting Edge of Beauty and Quality - Dan Chinnock Knives. Dan Chinnock crafts custom knives with sophistication and class. Using exotic materials, his knives are for the collector who thinks he has everything. We created this website in order to showcase the elegant craftsmanship, which can be found in each of these knives. This website allows Dan to sell his knives online and take requests for custom knives quickly and conveniently through his online contact us form.